This is a pair of opalescent champagne coupes with twisted stem. For sale are 6 sherbets or champagne glasses from Anchor Hocking in their 'Moonstone' pattern. I do all that is in my power to make a problem right. Set of 5 clear Iridescent champagne or sherry glasses. These glasses are in very good to excellent condition. I couldn't find any flaw on two of them. One has a scratch or very shallow crack near the rim. I think it's a scratch. You have to look hard in the right light to find it. 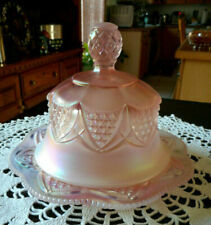 FENTON ART GLASS 1998~ 5146 D2~ LIMITED EDITION PINK CHAMPAGNE OPALESCENT HAND PAINTED PEDESTAL EGG. HAND PAINTED ROSES AND PEARLS ON PINK CHAMPAGNE WITH OPALESCENT FINISH. LOVELY 22K GOLD ACCENTS THE ROSES AND PEARLS ON EGG. FENTON ART GLASS CHAMPAGNE OPALESCENT IRIDESCENT: BUTTON AND ARCHES BUTTER DISH. MADE FOR AND SOLD THROUGH QVC IN 1997. STANDS APPROX. FENTON LABEL INTACT AND MARKED FENTON IN OVAL ON BOTTOM WITH 9 BENEATH. This is a set of two retired Fenton Glass Candleholders in excellent condition. They are in the iridized Champagne Opalescent color and the pattern is "Sheffield". Piece: Champagne Sherbet Glass. Pattern: MOONSTONE CLEAR OPALESCENT. Manufacturer: Anchor Hocking. China - Dinnerware Crystal & Glassware Silver & Flatware Collectibles. Condition: Very good condition for its age. This is one retired Fenton Glass Candleholder in excellent condition. It is in the iridized Champagne Opalescent color and the pattern is "Water Lily". Anchor Hocking Moonstone Opalescent Sherbet Dishes Set Of 4. Shipped with USPS Priority Mail. Up for auction! This is a set of 4 anchor hocking sherbet dishes. The color is opalescent. The pattern is moonstone. These dishes are approximately 3 1/2 inches in height. All 4 dishes are in great condition with no cracks or chips. If you purchase more than one item I will combine shipping. Thanks for looking and good luck! This is a very nice, old, 1942-1946, Anchor Hocking, Moonstone, Opalescent Sherbet,champagne glasses,3 1/2" tall, 3 1/4" across the top,no defects. They weigh 14 Ounces. Paneled Grape Blue Opalescent by Westmoreland 4"H 3 3/4D Sherbet. Excellent condition. Rare champagne flute by Creazioni Silvestri & made in Italy. Add these to your flute or Creazioni Silvestri collection. Price right! Creazioni Silvestri Arte Murano Crystal made in Italy 6 champagne flutes New in Box. They have a cherub on them and have a original stickers on them. Box has wear. Up for your consideration is this fabulous set of 4 champagne glasses. Material: Glass Color: Iridescent Style: Opalescent Type: Champagne glasses Quantity: 4 Capacity: 4 ounces Measurements: 4 1/2 in. tall x 3 1/8 in. across These estate found beauties are in very good to excellent condition. Please super size images for a more accurate description. Thank you for your interest. Set Of two 8 oz. Saucer Champagne glasses. They are in incredible condition with few noticeable marks upon close inspection. They were hand etched, and as such the design varies slightly from glass to glass. SET IS IN EXCELLENT CONDITION. ANY WHITENESS OR GLARE DUE TO FLASH. Gently used condition; one base has small chip (see photo #4). Champagne Sherbet Glasses. Dessert Goblets. French Opalescent. 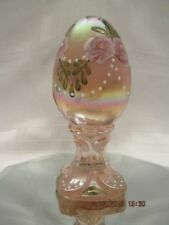 FENTON CHAMPAGNE OPALESCENT HANDPAINTED EGG. LIMITED EDITION #496/3000 FENTON #5146D2. NIB NEVER DISPLAYED. CREAZIONI SILVESTRI ARTE MURANO CRYSTAL Cupid CHAMPAGNE GLASSES SET OF 4. Shipped with USPS Priority Mail.